The Prodigals is an exciting new musical which first opens at the Belgrade Theatre, Coventry from 30 August to 14 September. It stars Simon Bowman (the original Chris in Miss Saigon) as Colonel Luke Gibson, the father of two sons. It’s a contemporary prodigal son story set in modern day Afghanistan that deeply touches your heart. 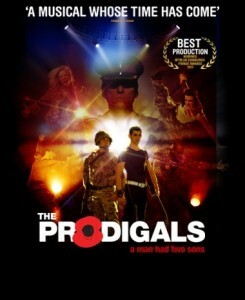 It was originally seen at the Edinburgh Festival Fringe as an hour long show and it won five star reviews which proclaimed it to be ‘Explosive, stunning, riveting … A musical whose time has come.’ The show has now been reworked to a full length musical with a great cast and personally I can’t wait to see it!